Alzheimer’s is one of the major medical problems of our time. This illness causes millions of people confusion, fear and a life lacking of quality, not to mention their families who join the circle of suffering. Studies in recent years reveal the close relationship between diabetes and Alzheimer’s, and show that a significant change in the daily diet can greatly reduce the risk of brain function and dementia. This article will discuss foods and supplements that can delay Alzheimer’s disease and dementia. At the end of the article you will be able to find information about the early signs and symptoms of Alzheimer’s disease, including risk factors. Scientists have discovered that Alzheimer’s is basically an initial metabolic disease apparently related to diabetes, so it is also called “diabetes of the brain” or “type 3 diabetes”. This surprising and interesting theory may bring with it hope that proven treatments to help people with diabetes may slow or stop the progression of Alzheimer’s disease. It is known that a diet low in essential nutrients is one of the reasons for Alzheimer’s, so if we want to lead large-scale preventive action – we should pay attention to what we eat. For more than half of the people who are at risk for Alzheimer’s, it is a preventable disease, if just attention has been given to lifestyle changes, including diet and exercise. Research found that higher values of insulin can negatively affect brain cells, and that a diet rich in fructose interferes with the long-term ability to learn and remember information. In addition, it was found that the brain of diabetic patients without dementia shrinks 2.5 times faster than normal, especially in the frontal lobe, which often tends to be affected in patients with Alzheimer’s disease, and is responsible for decision making, emotional control and long-term memory. The similar results that were found in patients with diabetes and patients with Alzheimer’s disease may indicate that the same process occurs in both of these situations, and it’s best to balance the body’s insulin function and build a diet which includes as little as possible industrialized carbohydrates that are abounded in fast food. Study investigating the effects of eating “junk food” on healthy adults found that after only four weeks there were blockages in their spinal fluid, affecting among other things the function of the neurological system. Studies in recent years clearly show that our nutrition has significant impact on brain health. It has been found that even a relatively small increase in blood sugar levels significantly increases the risk of dementia, even among people who are not diabetics. Therefore, you should avoid processed foods in general and keep a diet rich in fiber. Also gluten sensitivity, a protein found in grains such as wheat, barley and rye can result in neurological symptoms including dementia, even without signs of sensitivity of the digestive system. High level of carbohydrate in a meal increases the risk of local infections, so it is recommended to gradually replace most of the grains with non-starchy green vegetables that grow above the ground, and some fruits such as apples and berries . So What Should You Incorporate in the Menu? A study done on mice and published in The FASEB Journal revealed that red wine might put a cork on the formation of brain proteins tied to Alzheimer’s disease. Red wine contains resveratrol, a very powerful antioxidant that affects the brain. Drinking a glass or two of red wine a day have the ability to influence our brain function and quality of life in general. However, excessive use of alcohol will not prevent of course the development of Alzheimer’s disease, as it brings its own damage. Therefore it’s better to consume organic red grape juice that also contains resveratrol, or eat red and black grapes as well as berries. It is important to know that fruits in general consider to be aging inhibitors due to the antioxidants they contain. Other good source of resveratrol is peanuts, which you can eat as a snack or with fruit, but it is very important to check before that you are not allergic to them. Healthy fats are essential nutrients in general and are essential for brain function, so they are part of the solution. A diet rich in healthy fats and low in carbohydrates is one of the key significant change. Our bodies need a balance between the two types of essential fatty acids – omega 3 which is anti-inflammatory, and omega 6 that promotes inflammation. The ratio in the modern diet went wrong and is entirely too high in omega-6. This situation promotes inflammation and leads to diabetes, arthritis, heart disease, cancer, obesity and more. Therefore it is recommended to combine in the menu extra virgin olive oil, coconut oil, flaxseed oil or rice bran oil instead of oils that stimulate inflammation such as corn oil. Coconut oil, which is high in quality saturated fat, contains a special type of fat that provides the fuel for the brain and can especially help Alzheimer’s patients to reduce symptoms. 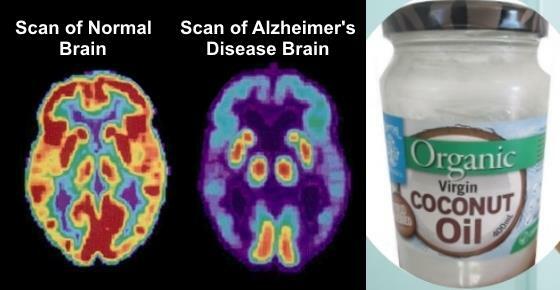 This is because when coconut oil is consumed by Alzheimer’s patients it seemed that healthy parts of the brain work better. The recommended amount is two tablespoons of organic oil a day. There is an anecdotal evidence suggesting coconut oil to cure Alzheimer’s. It all started when Dr. Mary Newport’s husband was diagnosed with Alzheimer’s at the age of 51. He quickly deteriorated to the point where he couldn’t tie his shoes, hold a conversation or read a book. His existing medication weren’t working and he was rapidly going downhill. Being a researcher, Dr. Newport started looking into the physiology of the brain and the changes that occur in the demented brain. She came up with a new possibility: coconut oil. She started her husband on four teaspoons per day, and soon noticed some amazing results. Not only did Steve Newport stop deteriorating, he also became more cognitively agile, was able to read again, interact, and walk around without help. Mary felt she got her husband back. You can see a video about Dr. Mary Newport and her husband at the end of the article. The Study about coconut oil – Dr. Newport wanted to quantify her findings, so she started applying for funding that would enable her to do research on coconut oil in relation to treating Alzheimer’s. After a lot of convincing, she was finally given green light. The USF Health Byrd Alzheimer’s Institute is supporting the first clinical trial of its kind, and the results are expected within a year. 65 individuals with mild to moderate Alzheimer’s are included in the study, which will look at the effects of coconut oil versus a placebo. To function normally, our brain needs fat and glucose. This is the brain’s fuel. Recent research has shown that a low-carbohydrate diet or a diet low in fats (especially essential fatty acids) can be detrimental to the function of our brain and can lower the mood. Stephen Cunnane, who studies brain metabolism at Université de Sherbrooke in Quebec, Canada, explains that when the brain starts starving, it slips into Alzheimer’s disease. Why coconut oil? – An alternative fuel needs to be provided to the brain. This is where coconut oil comes in. Coconut oil is rich in ketones. These molecules can be used by the brain as energy when there is a shortage of glucose. We talk of ‘ketonic effect’, which can also be achieved by eating a high-fat diet. Demonizing high-fat diets is becoming a thing of the past, and the benefits of coconut oil are now being hailed (you can read more about them in my article about the amazing health benefits of coconut oil). So far, coconut oil showed a lot of promise with patients in the earlier stages of Alzheimer’s, but improvements were also seen in the late stages of the disease, as was the case with Dr. Newport’s husband. Although there is no scientific proof yet, coconut oil definitely brings new hope. More testimonials are confirming positive experience people have with coconut oil in relation to their cognitive and overall health. Meat from grass fed animals – If you choose to eat meat, try to eat animals that are grass fed and not grain fed (corn), which is very rich in omega- 6. Fish rich in omega- 3 – Eat salmon and other fish rich in omega- 3, but make sure you that you buy salmon which was not grown in farms and was fed with food rich in omega-6. Omega- 3 supplement – Take Omega 3 (1-3 grams per day), especially the kind rich in DHA, known as the most important for proper brain function. You can also eat chia seeds and flaxseed that are rich in omega-3 as well as fiber, and buckthorn oil which is rich in vitamins, minerals and Omega 7. Amino acids are the building blocks of protein and are key components of neurotransmitters in the brain. They also help balance blood sugar levels, ease pain, depression and anxiety. Read here more about omega 3 fish oil health benefits and why it so good for you. B vitamins (B6 , B12) and folic acid are necessary for the production of neurotransmitters in the brain. Supplement of B-complex can also reduce levels of anxiety and stress and improve mood. Also be sure to incorporate in your menu foods containing vitamin E (such as nuts, seeds, avocado and fish) that slows the progression of the disease. Consult with your doctor before taking any supplements. Scientists now link vitamin D deficiency with a substantially increased risk of dementia and Alzheimer’s disease in older people. The research findings are very valuable and open up fresh possibilities in this area of health care and prevention. You can read the full details in my previous article about this subject. Maintaining proper vitamin D levels is also one of the 70 habits featured in my e-book 70 Powerful Habits For A Great Health which will guide you how to take positive steps to improve your wellness and overall health. Combine in your menu turmeric, an important anti-inflammatory spice that has been shown to improve Alzheimer symptoms. Turmeric is a powerful and effective spice for many other ailments, and you can read more about it here. You can learn more about turmeric and other herbs in my e-book the Herbal Remedies Guide. This guide will teach you how to treat common ailments using herbs. Avoid cigarettes, alcohol, processed foods and exposure to toxic metals such as aluminum and mercury, and drink at least eight glasses of water a day. 1. Memory loss – People suffering from Alzheimer’s often tend to forget recently learned information and may ask you the same questions over and over. They may even have trouble remembering significant dates, numbers and places that are familiar to them. 2. Confusion regarding time and place – AD patients often lose their way to their own house, losing track of their location and even forgetting how they got there. They may also have trouble understanding what time, day and season it is currently. 3. Losing things – People suffering from AD often misplace things, putting them in unusual places, and accuse other people of taking things. 3. Mood swings, personality changes and social withdrawal – Alzheimer patients may display extremely erratic mood swings, sometimes even without a reason. They confine themselves to a set routine and display signs of confusion, sadness, fright and anxiety around family, friends or colleagues, whenever they are placed outside their comfort zone. They might be less involved with their favorite hobbies and lack motivation, disconnect themselves from social situations and even from family gatherings. 4. Changes in Vision– People suffering from AD may have difficulty in reading, judging distances and differentiating between colors or contrast. This may even lead to problems while driving. 5. Speaking and writing problems – AD sufferers have communication problems, they can’t find the right word, call things by their wrong name, find it hard to continue a conversation and are often repetitive in their speech. Their speech and writing style may even be incomprehensive and incoherent. 6. Poor problem solving and planning abilities – Alzheimer patients have trouble making plans and sticking to them, find it hard to concentrate on detailed tasks, especially those that involve numbers, such as keeping track of their bills and balancing their checkbook. They make poor decisions and don’t use their judgement. 7. Difficulty Performing Routine Tasks – They find it difficult to perform tasks which were earlier routinely performed by them like cooking, driving, or completing ordinary tasks at work. They may also ask for assistance even for the smallest of tasks. 1. Age – The risk of having Alzheimer’s disease increases as you get older, and for most people it starts after the age of 65. 2. Family history – Family history is another strong risk factor for developing AD, especially if you have first degree relatives like parents or siblings that have Alzheimer’s. 3. Gender – Women are more prone to developing this condition as compared to men. 4. Lifestyle – Lifestyle related conditions and habits like high cholesterol levels and high blood pressure can also increase your risk. 5. Head injuries – People who have suffered serious head injuries are at a greater risk of developing Alzheimer’s. 6. Down syndrome – People with down syndrome often get AD in their 30s and 40s. Another risk factor of developing AD is the use of benzodiazepines, which is a group of drugs that includes Valium, Xanax and Ativan. Many people struggle with sleeplessness and anxiety. Instead of making some lifestyle changes, most resort to pharmaceutical drugs. It has been established that around 43% of older adults routinely use benzodiazepines. People get dependent on these drugs and start using them on a long term basis. This goes against the international guidelines that recommend short term use only, e.g. a few weeks. Research has now linked benzodiazepines with the onset of dementia and Alzheimer’s disease. This September, a study was published in the British Medical Journal (BMJ) that looked at the relation between the risk of Alzheimer’s disease and exposure to benzodiazepines. It involved 1796 people with a first diagnosis of Alzheimer’s disease who were followed for a period of 5 years before they received the diagnosis. They were matched with 7184 controls. The analysis revealed that Benzodiazepine use is associated with an increased risk of Alzheimer’s disease. The association was stronger if the drugs were taken for a longer period of time. The authors concluded that long term use of these drugs should be considered a public health concern. Another study that cautioned against the widespread use of benzodiazepines was published in BMJ in 2012. The study concluded that use of benzodiazepines was associated with increased risk of dementia. These new studies added to the knowledge that already existed on the topic of benzodiazepines. It has been known for a while that they can have an adverse effect on person’s cognition and cause cognitive decline, which can lead to dementia. The aforementioned studies confirmed this theory. Commonly used sleeping pills have also been linked to cancer and premature death. Daniel Kripke, who is a medical doctor, published an e-book titled The dark side of sleeping pills. In it he suggests that people who use sleeping pills have a greater risk of developing some types of cancers, and they are four times likely to die while taking the drugs. Benzodiazepines are also very addictive and cause serious withdrawal symptoms. That is why you shouldn’t be taking them over an extended period of time. They activate the same neurotransmitters that opioids and cannabis do. Ironically, when you stop taking anti-anxiety drugs, you get overwhelmed with extreme anxiety. It seems that the best and safest solution is to deal with sleeping problems and anxiety in a more natural way. Make sure you get enough exercise. Use relaxation and breathing techniques, such as meditation and yoga. You can read my previous article about 14 effective natural remedies for stress and anxiety. Watch your diet and include enough omega-3 essential fatty acids, which help with emotional well-being. Also read my article about the best foods to boost your mood. Prepare for sleep: avoid caffeine in the afternoon, don’t eat a few hours before bedtime, take a hot bath or shower before sleep (you can also use some calming essential oils, such as lavender or chamomile oil), have your bedroom dark and cool, remove distracting or loud objects from the bedroom. You can also use these best 12 herbs for insomnia, these foods to get better sleep, or this natural substance. Once again, it’s a far better idea to stick to a more natural approach than to expose yourself or your loved ones to drugs which have not been approved as safe and effective. There are indeed many references in the web for medical use of marijuana (cannabis) for Alzheimer sufferers. Actually, THC is not the cannabinoid that helps. CBD is the compound that destroys beta amiloid, the protein that causes Alzheimer’s. Most strains of cannabis do not contain high levels of CDB but breeders are using lab test to develop strains higher in CBD, such as “cannatonic”. Please do a search for CBD and Alzheimer’s if you are interested. If you live in an area that has medical maryjane shops, they will most likely have at least one high CBD strain in stock. These strains will not get you “high”, CBD actually blocks the effects of THC, they are purely medicinal. Alzheimer’s and diabetes are both linked to Mitochondrial dysfunction (not full blown mito disease but dysfunction). Google Mito cocktail or reference UMDF.org (United Mitochondrial Disease Foundation)….there is info there on the linkage between them…. thank u so much for this Healthy and Natural World it help me look for these herbs and apply it to my family ang myself as well. Hi Stephanie, I have seen references that they are made from aluminum with a food grade shellac coating, but I’m not sure if the shellac is safe. I’ve seen that Shellac NF is food grade and is listed as Generally Recognized as Safe (GRAS) by the FDA, but couldn’t find more information about it. I have heard that aspartame can contribute to the development of Alzheimer disease. My mother was diagnosed with Alzheimers, and I remember how she used quit a bit of Sweet and Low and other artificial sweeteners or her foods and drinks. My dad took all those supplements, didn’t smoke, walked or biked several times a week, did not drink, and did not have diabetes, and he still developed Dementia.